Well, the sailing season here is officially over. The Blue Moon is off her summer mooring and tucked into her regular winter slip in the Huntington Mill Dam Marina where she will spend the winter with her sisters. Blue Moon with brown winter tarps on Google Maps! Zoom out to see plane in the middle of harbor. But my winter project list is still growing longer. One job recently popped to the top of the list when I realized I needed it done now. Because Huntington Bay freezes over, I must replace my mooring ball, pennants, and pick-up stick with what the locals call a 'winter stick'. This is a simple 4" x 4" x 8' piece of cedar with a chain attached to it's bottom. The other end of the winter-stick chain is shackled to the main mooring chain. The winter-stick chain is long enough to reach the bottom of the harbor. That allows the main chain to spend the winter buried in the mud, which keeps it from rusting or wearing over the winter. The stick needed to have my name and mooring number written on it, some how. Most people just paint it on, but of course I had to make it a bit more complicated than that. Despite the fact that time was short, I decided I needed to carve my name and number into the cedar. 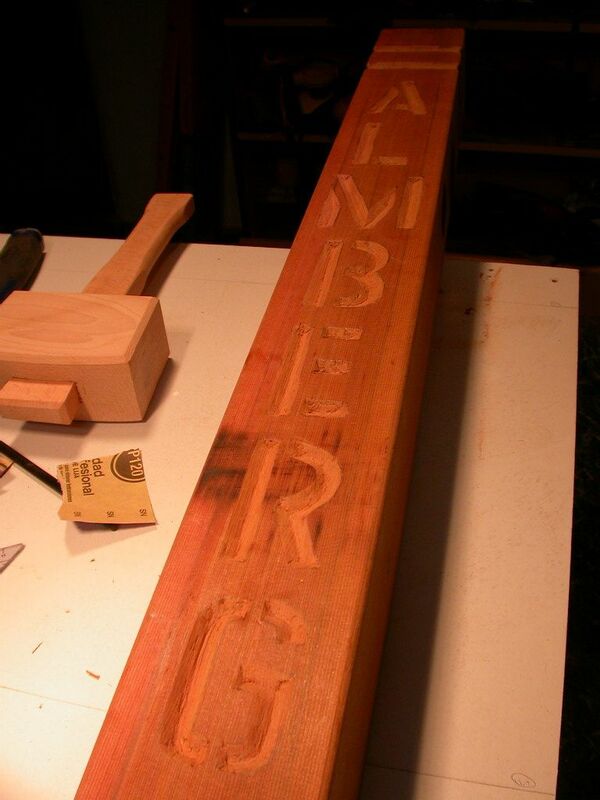 I'd never done any carving, but -- never one to let simple, though absolute, ignorance stop me -- I soon found an excellent video tutorial on the Fine Woodworking website by a long-time sign maker from Maine, named T.J. McDermott. I can't describe Mr. McDermott's process better than he does himself, so if you are interested, you can view his video here: Letter Carving Basics. Thus armed with the theory, I set to the practice. As with many new skills, I got so absorbed by the process that I forgot to take pictures until I was done. Taking my time, it took two evenings (about 3 hours, total) to carve my name on one side, the 4 digit mooring number on the other, and two decorative 'rings' around the top. The job went pretty slowly at first, but then picked up speed as I got the hang of it. Cedar doesn't carve as cleanly as mahogany, but the results were good enough for me, and certainly good enough for a simple winter stick. 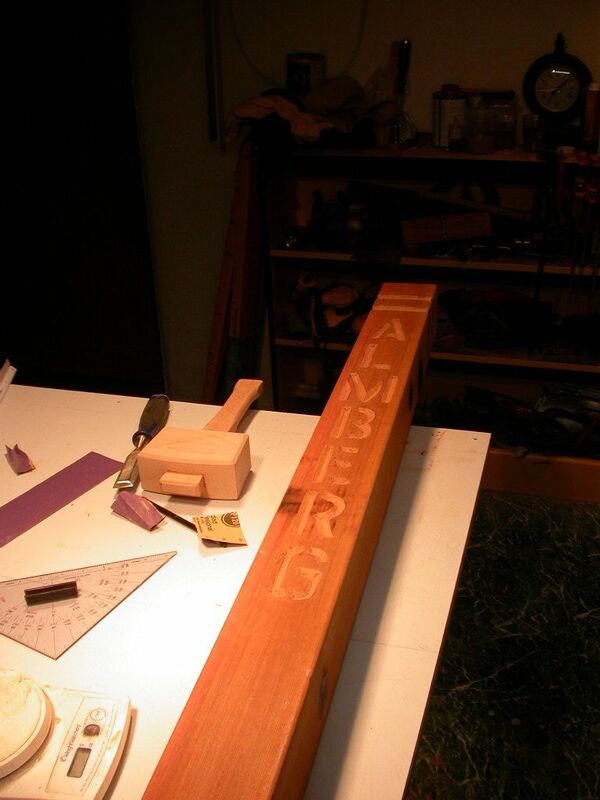 No special tools required, just a sharp pencil, a few sharp chisels, and a mallet. Quite a fun project, actually! I can see it now... this winter is going to go too fast. for a first effort, I hope!